'Dressing The Part' - Lockwood & Co writer explores clothing in Literature. Clothes! As a card-carrying dishevelled author, this isn’t normally a subject to which I pay much attention. Why should I? I seldom go out. On my rare excursions away from my desk I emerge blinking into the light in the first things I’ve pulled from my drawer. Odd socks, holey jumper, crumpled t-shirt. It’s a good day if I’m wearing any trousers. Worzel Gummidge would shy away from me; Stig of the Dump would think me under-dressed. No, clothes have never been top of my agenda. And yet, when it comes to fiction, I can see it’s worth paying attention to what my protagonists are wearing. An outfit has immense importance – to the reader, to the author, to the characters themselves. It’s a shorthand thing, first of all. Clothes help fix the figure in the reader’s mind. So many notable characters in popular literature are symbolised by what they wear or carry. Sherlock Holmes has his deerstalker, Paddington his duffel coat, Gandalf his broad-brimmed conical hat and long clay pipe. Subtleties are lost along the way. Long John Silver is immortalised by his wooden leg, his long blue coat, his tricorn hat, the squalling parrot on the shoulder… But who remembers how Stevenson described his face? (‘As big as a ham – plain and pale, but intelligent and smiling’.) And who remembers that he had no wooden leg – that his lost leg was cut off just below the hip, not at the knee? When beginning a book, clothes work as shorthand for the author too, as an instant way of getting to know a character. It’s like entering a lift with a stranger: you get a swift visual impression, a rough sense of who they might be. Then you get them talking and more is revealed. Pretty soon after that you’re having dinner and they’re blurting out their whole life story… Actually, this doesn’t happen to me too often in real life – only in fiction. But the clothes help ignite it all. 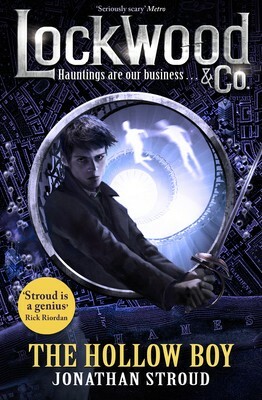 Anthony Lockwood, ghost-hunting hero of my Lockwood & Co series, is a case in point. When I first wrote him into existence, he was standing on a London doorstep with his friend Lucy, ready to go in to tackle a haunting. At that point I had no idea who these teenagers were. They were modern kids, I knew that, and the girl wore leggings, boots, a thick parka – pretty sensible get-up for chilly paranormal investigations. But the boy… hold on, what was he wearing? A long dark coat, a natty suit (a bit too tight for him), a crisp shirt, even a tie. Gloves too. What did that tell me? Instantly I knew that he was fastidious and self-controlled – with his emotions buttoned-down. I knew that he dressed older than his years. I knew that he intended to create an impression – that when the door opened on whatever frightened person lived there, he would soothe and reassure them with his elegant attire. As I kept writing, those clothes led me in different directions. I realised they reflected a society where conventional roles were flipped, where ghosts were real and dangerous, yet only the young could see them; where adults cowered in the background while children went out to deal with the murderous dead. So the suit and coat (not to mention the rapier at his belt) were Lockwood’s uniform, a mark of his social status. Yet at the same time they were slightly comic too. His colleagues, Lucy and George, regularly made rude remarks at the way his swanky coat kept getting caught in doors or stuck in thorn-bushes as he ran away from something nasty. There was humour as well as danger in this world. In short, clothes aren’t a replacement for a character’s personality – but, as in life, they can sure help signpost it. It’s something I should probably take heed of myself, to be honest. Now… where did I put those trousers? Lockwood & Co. But its three agents - Lockwood, Lucy and George - are exceptional Talents. Well, that's if they can put aside their personal differences for long enough to march into action with their rapiers, salt and iron . 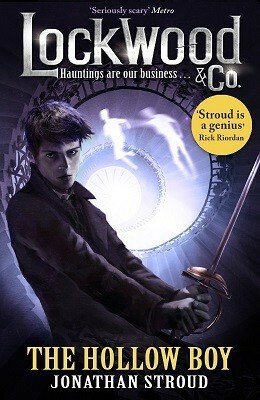 'Stroud is a genius' - Rick Riordan, author of the Percy Jackson series.